“Word Balloons” Storms the SDSU Downtown Gallery During Comic-Con 2015 : COMICS ARE EVERYWHERE! The "Word Balloons" postcard features artwork by SDSU art student Kristian Riveria. It’s that time of year when the prayers of legions of comic-book readers and pop-culture enthusiasts are finally answered. Of course, I’m referring to the supernova of pop-culture bliss that is Comic-Con International, which gets underway with Preview Night on Wednesday, July 8 before the convention officially opens Thursday, July 9 through Sunday, July 12. This week, Comic-Con transforms the San Diego Convention Center into a thriving hive of comics and playful genre mayhem and fun at ground zero where graphic novels merge with film, science fiction, fantasy and horror and all points in between. The infectious spirit of this pop-culture extravaganza isn’t restricted to the San Diego Convention Center or the Gaslamp District’s Mardi-Gras-like atmosphere during the height of Comic-Con mania. 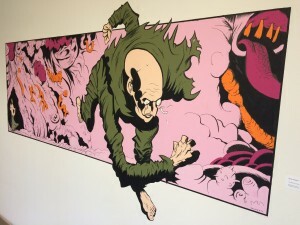 Gallery-goers can get their comic-book fix at the exhibition “Word Balloons: Comics at San Diego State University,” co-curated by my artist-friend Neil Shigley and myself. 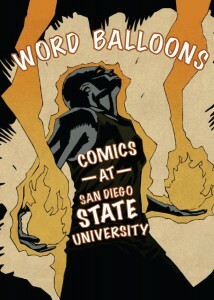 “Word Balloons” is on display at the SDSU Downtown Gallery, located at 725 West Broadway, San Diego, CA 92101. The group art exhibition showcases the comic-book-inspired artworks created by SDSU students who took Shigley’s Drawing & Illustration class and my Graphic Novel course, along with artworks created by SDSU alumni, among others. During the exhibition’s opening reception from 6 pm to 9 pm on July 9, SDSU alum and respected artist Hugo Crosthwaite will put the finishing touches on his comics-fuelled, monochromatic mural that is one of the centerpieces of this fun and creative art show. When gallery-goers enter the exhibition space, they will be greeted by SDSU alum and artist Richard Tackett’s colorful and dynamic mural “The Moving Hand,” featuring a bald, scrawny character bursting from a comic-book panel. Photograph by Neil Kendricks/ Ricard Tackett's mural "The Moving Hand' is among the numerous artworks on display in the exhibition "Word Balloons" on display at the SDSU Downtown Gallery through July 27, 2015. What started out as an experimental, interdisciplinary art project between Shigley’s class and my course in 2009 has morphed and expanded into the comic-book anthology series “Word Balloons” that we edit and publish through Blurb.com. The process behind our collaboration starts with my Graphic Novel students developing and writing short, original scripts. Following the mantra that “less is more,” I encourage these budding writers to express themselves by writing visually. The scripts place a strong emphasis on visual storytelling and compressing information into as few panels as possible. Then, the completed scripts are distributed to Shigley’s class, and many of his students also draw their own comics based on their ideas generated in his class. Without question, this multi-faceted, interdisciplinary art project in DIY comics involves an enormous amount of time, energy and effort to pull off. Although my Graphic Novel course is rarely offered through SDSU’s Department of English & Comparative Literature, the project has taken on a momentum of its own. Shigley and I continue to publish a new issue each semester to keep the project moving forward as a forum for artists and writers alike to see their work in print. Fortunately, our collective efforts have found an audience. SDSU’s Love Library has purchased all of the issues of Word Balloons and included these self-published comics in its Special Collection. And now select comics from the various issues of Word Balloons grace the walls of the SDSU Downtown Gallery’s exhibition space through July 27. At the time of this writing, we are publishing Volume 12 of Word Balloons and counting! But the “Word Balloons” exhibition’s fun and interactive art activities go beyond Comic-Con weekend. On Thursday, July 16, the gallery is hosting a live-drawing event from 6 pm to 9 pm featuring the outstanding artist’s model Christa Maier whom I’ve often hired when I taught life-drawing courses at Platt College. Maier, who is an active participant in San Diego’s cosplay community, will be wearing her hand-made, comics-inspired costumes and gallery-goers are encouraged to bring sketchbooks to brush up on their drawing skills during the free event on 7/16. From large-scale murals and exciting pages of comic-book art to a free live-drawing event, what more could a comic-book fan want? So, take a break from Comic-Con’s Exhibit Hall and the long lines waiting outside of Hall H to check out what “Word Balloons: Comics at San Diego University” has to offer for comic-book veterans and curious gallery-goers alike. I promise you won’t be disappointed!